First presented in 1988, the Bridge Exhibition Series was established to heighten the public’s awareness of the powerful work being produced by contemporary artists. 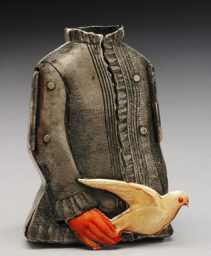 Over the course of the series, SCC has presented solo exhibitions by 28 contemporary craft artists, highlighting techniques in a broad range of media including clay, metal, fiber, wood and glass. Three female artists from diverse racial and cultural backgrounds who are creating exceptional works that express progressive and unconventional points of view around social, political and philosophical themes have been selected for the 2011 Bridge Exhibition Series. Chosen for the high level of their craftsmanship, the series will feature solo exhibitions by Lia Cook (fiber), Mariko Kusumoto (metal), and Anne Drew Potter (ceramics). Crossing geographic and gender boundaries, these artists will engage audiences in a dialogue about the influence of race, gender and culture on contemporary art production. 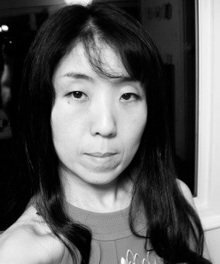 Japanese-born metalsmith, Mariko Kusumoto, creates intimate metal environments that evoke the rich, sensual Japanese culture of her childhood. A brilliant technician, she masterfully fabricates and embellishes boxes using a variety of techniques including etching, electroforming, and patination. With astounding attention to detail she explores interior spaces, deftly transforming each compartment into interactive miniature theaters, revealing figures and objects with dozens of movable parts, rotating gears, and musical mechanisms. She comments, “In my work, I am striving to create a world of shadows, light, silence, spirituality, and my personal memories. My father is a Buddhist priest, and I grew up in a temple that was founded four hundred years ago. While living in the temple, I took the place for granted and didn’t think anything special of it. However, the more time that I spend living in the United States—with its diverse cultures and varied ethnic groups, the more conscious I become of my identity as a Japanese. As the yearning for my temple grows, I gain a greater sense of appreciation of it, as well as of Japanese culture in general. As time goes by, my memories become stronger and more vivid. This feeling is the inspiration of my artwork today.” Kusumoto will travel to Pittsburgh in the spring to assist with the installation. Complex in their assembly, each of Kusumoto’s featured works are made up of nearly 100 individual pieces. 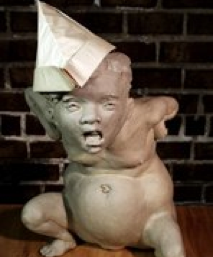 With an interest in the complex and contradictory nature of the human experience, ceramic artist Anne Drew Potter creates “performative” clay figures and unsettling installations that address the ways in which social meaning is projected onto forms of the body. By creating a tension between physical forms and exaggerated expressions Potter highlights signifiers of gender, race, and age and encourages viewers to confront their feelings about normalcy and difference. The artist explains, “I am interested in the moment when the self-evidence of our own experiences is challenged by confrontation with the other, the infinity of realities that exist outside of our own.” For this exhibition, the artist has created an installation titled The Captain’s Congress, which consists of 16 distorted figures. All but one of the figures are placed in a circle, each wearing a jaunty sailor-style hat made from newspaper. The 15 “Captains” are depicted talking at once, in an animated manner, and the lone figure seated outside of the circle—ironically larger, more naturally rendered—is at the mercy of these shorter and more distorted figures. Her face betrays a hidden voice, a desire to share and an interest in being included in the group. The installation explores concepts of self-appointed authority, ineffective communication, bullying and victimization. Potter was born and grew up in Berkeley, California, and her childhood and education were permeated with an activist social awareness. The artist attended Swarthmore College in Pennsylvania for her undergraduate education. 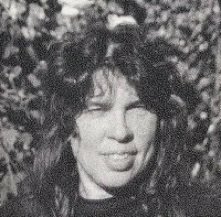 Her studies in history and dance at Swarthmore both directly informed the content and form of her developing artwork and helped her contextualize her experiences and observations in terms of larger historical-social-political narratives. Potter went on to earn two MFA degrees, the first from the New York Academy of Art in New York, and the second from Indiana University, Bloomington. 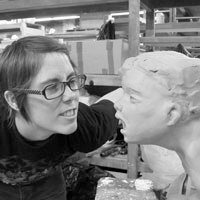 Upon finishing her second MFA, she was awarded the Matsutani Fellowship at the Archie Bray Foundation in Helena, MT, where she was a resident artist until 2009. Potter was honored in 2009 by the National Council on Education in the Ceramic Arts (NCECA) with the Emerging Artist award. She is currently a resident artist at Pottery Northwest and lives in Seattle, WA. Following the opening of this exhibition she will be relocating to Germany as a recipient of the German Chancellor Fellowship in order to complete a yearlong project at the Zentrum Für Keramik in Berlin. astounding how inaccessible and unfamiliar our bodies are to us…read more. Using self-portraiture as a visual base, Lia Cook’s current practice incorporates concepts of cloth, touch, and memory. With her use of a digital loom, digital pixels become thread as she weaves images and creates monumental works that blur distinctions between computer technology, weaving, painting, and photography. 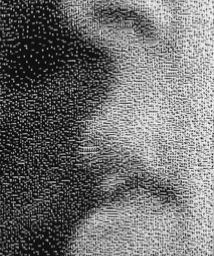 In spring 2010, Cook participated in a residency at the University of Pittsburgh School of Medicine called TREND (Transdisciplinary Research in Emotion, Neuroscience and Development) in collaboration with Greg Siegle—a PhD professor of psychiatry at the University of Pittsburgh—who collected computer data in real time and mapped the human brain at work in response to her woven faces as stimuli. The Bridge 11 exhibition will explore Cook’s intimate images of human faces and introduce several works from this new body of work based on her recent art-neuroscience collaboration. A joint lecture by Cook and Siegle, co-sponsored by SCC and the Fiberarts Guild, will examine human brain mapping and the artist’s new body of work which extends her work with faces to include a focus on the brain, how we can understand and visualize the brain’s response to the memory of tactile and emotional experience.